Brand: Patchwork Cutters PWC-XLN7 Units: 1 Patchwork cutters / embossers have been developed to assist new and experienced cake decorators to create their individual designs with flair and originality. Cut out designs with gum paste, fondant or the Mexican Paste recipe included with the cutters (Mexican Paste calls for gum tragacanth, powdered sugar and water). The cutters can also be used as an embosser in fondant covered cakes or buttercream iced cakes (allow buttercream to crust before embossing). Number cutter measures 4" tall by 3" wide. 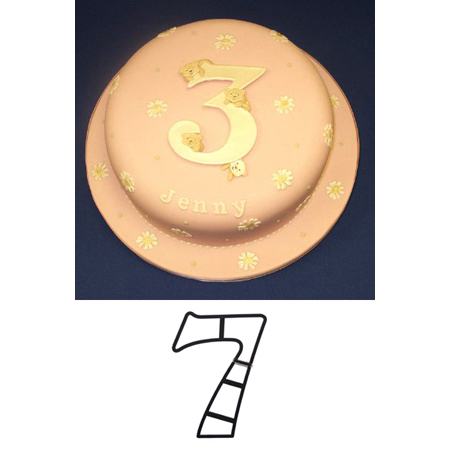 Patchwork cutters / embossers have been developed to assist new and experienced cake decorators to create their individual designs with flair and originality. Cut out designs with gum paste, fondant or the Mexican Paste recipe included with the cutters (Mexican Paste calls for gum tragacanth, powdered sugar and water). The cutters can also be used as an embosser in fondant covered cakes or buttercream iced cakes (allow buttercream to crust before embossing). Number cutter measures 4" tall by 3" wide.